What are Typical Restaurant Equipment Leasing Terms? Foodservice is right near the bottom of the list of industries financiers "like" - because so many restaurants fail. There is some argument over what the true failure rate of restaurants is, but some studies estimate that 60% of restaurants fail in the first year of business, and 80% of restaurants fail in the first five years. ...but in the vast majority of circumstances the numbers those calculators spit out are nowhere near what your actual payments will end up as. In order to get real numbers, you'll have to fill out a credit application, and the real rates won't be revealed until you're fully "locked in." For every $50,000 worth of financing, the calculator will show you a payment of about $1,050 over 5 years. Those numbers assume finance charges of about 5.5% per year - and while those numbers occasionally represent accurate rates, a good portion of the time, depending on your situation, the rates could be significantly higher. What are (Real) Restaurant Equipment Financing Rates? Let's go back to the example of $1,050 as a 5-year payment on $50,000 worth of equipment. 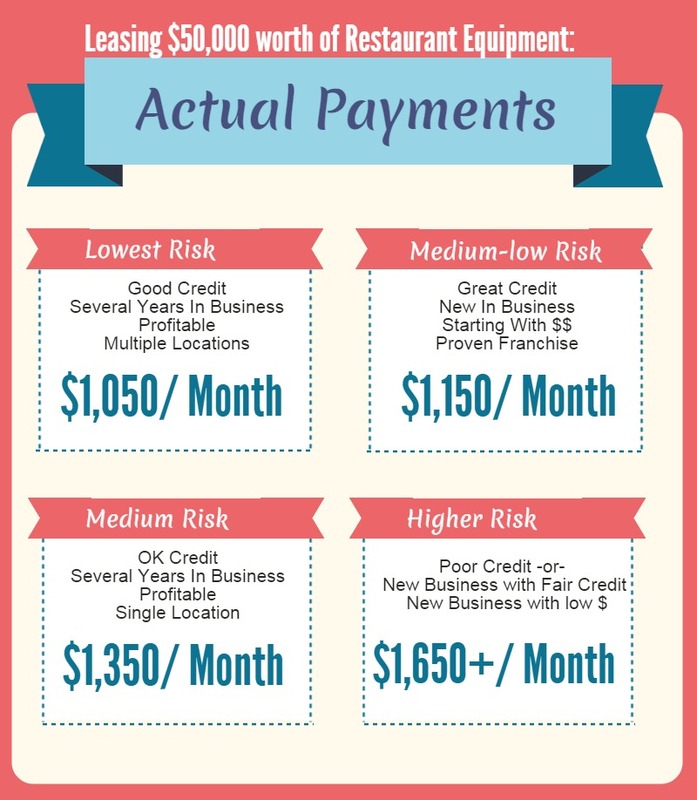 In order to get payments that low, you usually need at least 3 years in business, good credit (both business and personal), and a history of strong cash flows and profitability. If you're trying to lease restaurant equipment with bad credit, for example, depending on how bad your credit is, payments could easily be 50% higher than that - or more. The truth is, once you add the high failure rates in foodservice to the fact that you don't get very much when you try to sell a repossessed oven - if your credit is really bad, sometimes there is no way to get you approved for leasing no matter what the rates. Restaurant equipment leasing rates for startups are not likely to be low - because you're asking a financier to take on a lot of risk - although the rules are a little bit different if you're financing a restaurant franchise with a history of success. While no online resource can show the entire scope of payments given the zillions of variables a real human uses in analyzing a finance deal, those numbers should give you an idea of what it really costs to get financing to buy equipment for a restaurant. #2 - Phony Restaurant Equipment Leasing Company "Proposals"
In the past several months, more than one customer has forwarded to me examples of what they thought were approval letters but were actually lease proposals - meaning the customer had not actually been approved for financing. These "proposals" had been slyly crafted to appear to be an approval, but had smarmy lawyer talk buried in them to twist everything around so that if the company came back with a payment way higher than the proposal stated (which, is usually what happens) the company owes money to back out. Do you want to know how they get the money? The last proposal I saw asked for a first and last payment upfront - which is very normal and customary to start an equipment lease - but very not normal for a proposal. This is a big problem in the financing industry right now - someone used to looking at contracts can spot the inconsistencies right away (in this particular case, the proposal quoted solid "A-" financing rates when the customers' credit rating was a "C" at best...) but if you are not in the finance industry the stink isn't so obvious. The other challenge is that there's a little bit of a gray area - many totally legit companies ask for a "commitment fee" of a few hundred dollars to cover costs of underwriting, (for example, if you were leasing used restaurant equipment and an inspector had to be sent out to look at the equipment before approval) and will happily refund those fees if they ultimately end up declining the transaction. However, asking for 2 payments, or for several thousand dollars upfront before a full and final approval is something you never should have to do and a sign that you need to look elsewhere for financing. Most equipment financing contracts don't actually have a stated "rate" - since they are technically done as a lease, not a loan, they are not accounted for like a bank loan, so are not quoted like one either. They know that most people who call them don't really know how to calculate the rate anyway. This kind of swindle really makes honest equipment finance professionals angry - it's hard to compete against someone who lies about what the rates are since the swindlers can just make up any low number they want. The easiest way to combat this garbage when you're shopping - worry about comparing payments (on an apples-to-apples basis) rather than rates. In most cases, financing for restaurant equipment will not be comparable to bank financing (sometimes, for very well qualified borrowers, rates can actually be cheaper once you factor in the tax benefits of leasing - but not always) so instead of worrying about the "rate", it's probably best to worry about if the amount of money you'll generate from use of the equipment justifies the monthly cost of the equipment, right? The second most common question equipment financing professionals get asked is, "are there prepayment penalties?" Do you want to know how an honest company answers this question? While there technically aren't ever any penalties for paying the lease or finance contract off early, in 99% of cases, there isn't any benefit to paying your lease off early either. There are sometimes early payoff discounts offered by leasing companies - but the discounts are usually very small. - and if you ask a company if there are prepayment penalties and they say, "no" 99.9% of the time the answer is totally bogus. The #1 best way to be safe... shop with a company that you know will be honest. There are a lot of companies that don't actually do equipment financing per se, but do what's called a "daily payment loan." Daily payment loans can sometimes be an appropriate option for your business, since they are very easy to qualify for. When companies present a daily payment loan (sometimes also called a "working capital loan" or "merchant cash advance") as the first option for equipment acquisition, that is your cue to find somebody else to work with. Do You Want Real Answers On Restaurant Equipment Leasing? Hopefully, this article will help you avoid some of the biggest scams out there when you are trying to finance an equipment purchase for a restaurant. To apply for financing, give us a call at (866) 631-9996, or click on the picture below.